Our clients came to us because their house was clearly not living up to the spectacular location. The views of the solitary islands were obscured, the layout confused and the house dark. The outdoor entertaining areas were small and mostly uncovered, and there was not enough car parking allowed for onsite to match council requirements. We came up with a unique solution for the entry sequence, injecting light and space into the centre of the house, whilst separating the pedestrian entry from the driveway. We also included cross ventilation points at this side of the house without compromising the security of the front door. 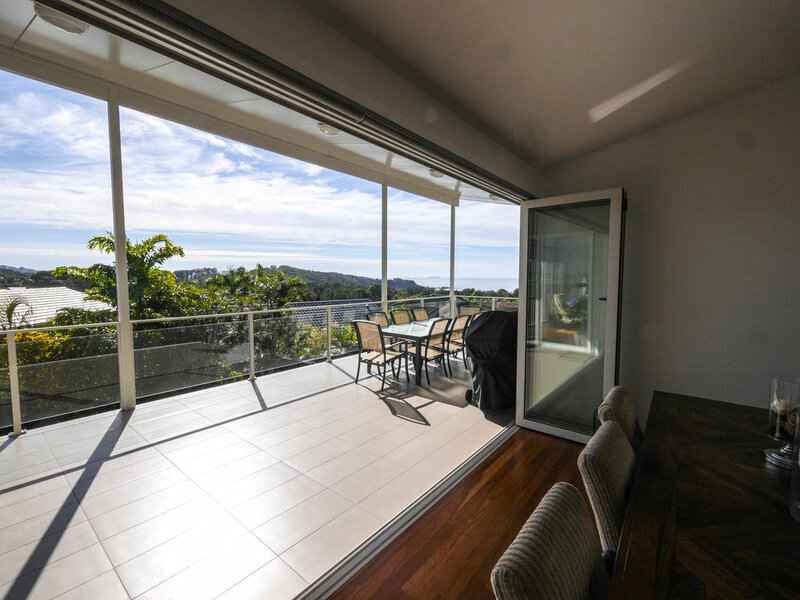 The Lounge room expanded onto the existing deck under a new section of roof, and the outdoor space was enlarged and covered properly to give year round protection from weather. The roof was designed with passive solar in mind, and as a result our clients have not needed heating this winter or cooling in the summer just passed. The Kitchen/Laundry/Pantry rearrangement was achieved by giving back internal house space to a drying deck adjacent to the laundry, which nonetheless has provided better storage and organisation as a result. We engaged G2 Architects to bring new life to our tired 70’s style house, which failed to take advantage of its northerly aspect and views. The journey to our new lifestyle has been most enjoyable. At each and every stage we felt completely at ease with the process. Ollie’s enthusiasm and Anne’s experience combined to guide us seamlessly from concept design to building completion. G2 Architects have delivered us amazing value, not only in terms of our new lifestyle, but also financially. We would happily recommend G2 Architects to anyone.